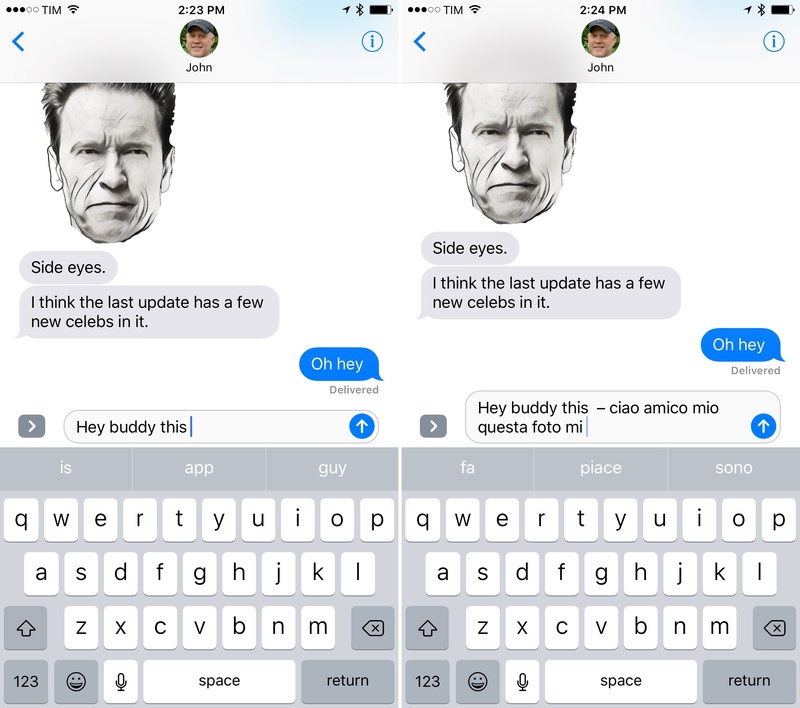 While last year's software keyboard improvements focused on iPad productivity, iOS 10 brings pleasant enhancements that will benefit every iOS user. The most unexpected change in iOS 10 will be as important as copy & paste for millions of international users. iOS 10 adds support for multilingual typing without switching between keyboards. The annoyance of alternating keyboards isn't an issue everyone can relate to. Most single-language speakers only deal with emoji as a separate "keyboard" that requires switching from the QWERTY layout. Those users probably don't even see emoji as an additional keyboard but just as a special mode of the main system one. Millions of people have never seen iOS' old keyboard system as a problem. How most English speakers deal with the system keyboard. For speakers of multiple languages, the experience couldn't be more different. As soon as a third keyboard is added to iOS, the emoji face turns into a globe button to switch between keyboards. Tapping it repeatedly cycles between all keyboards; alternatively, holding the globe button brings up a list of them. How international users switch between keyboards. Anyone who uses an iOS device to hold conversations in multiple languages is subject to a slower experience. When you're constantly jumping between iMessage conversations, Twitter replies, Facebook, email, Slack, and Notes, and when you're staying in touch with friends in multiple languages, and after you've been doing it every day for years, those seconds spent cycling through keyboards add up. Millions of people see this as one of the biggest flaws of iOS. 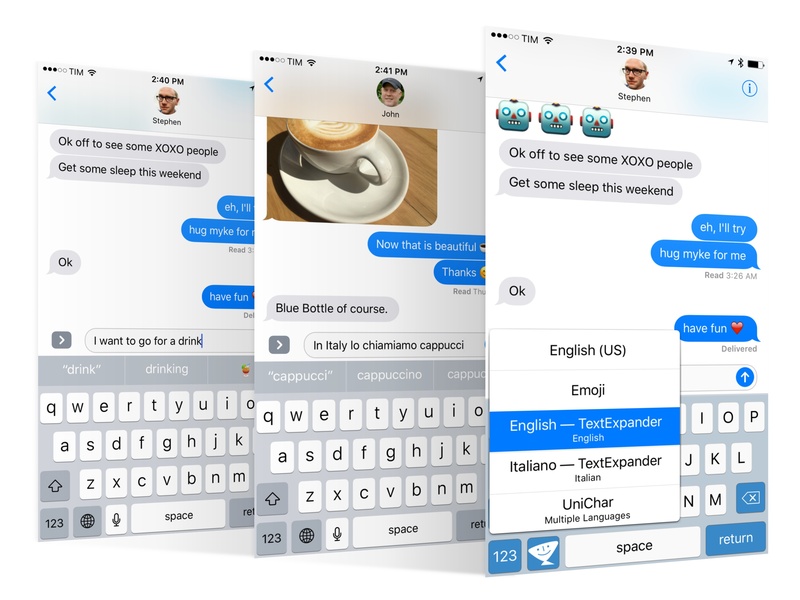 In iOS 10, Apple is taking the first steps to build a better solution: you can now type in multiple languages from one keyboard without having to switch between international layouts. You don't even have to keep multiple keyboards installed: to type in English and French, leaving the English one enabled will suffice. Multilingual typing appears to be limited to selected keyboards, but it works as advertised, and it's fantastic. The idea is simple enough: iOS 10 understands the language you're typing in and adjusts auto-correct and QuickType predictions on the fly from the same keyboard. Multilingual typing supports two languages at once, it doesn't work with dictation, but it can suggest emoji in the QuickType bar for multiple languages as well. Switching between English and Italian from the English keyboard. I started testing multilingual typing on my iPhone and iPad Pro on the first beta of iOS. The best part is that there's very little to explain: suggestions retain the predictive nature of QuickType based on the context of the app or conversation, and you can even switch between languages within the same sentence. There's no training or configuration involved: it's as if two keyboards were rolled into one and gained the dynamic context-switching of a multilingual person. Knowing which languages can work with multilingual typing is a different discussion. Apple hasn't updated their iOS feature availability page with details on multilingual typing yet. My understanding is that only keyboards with support for QuickType predictive suggestions and with a traditional QWERTY layout support multilingual typing. You should be able to mix and match Italian and English, or Dutch and French, or German and Spanish, for instance, but not Chinese and English within the same keyboard due to differences in the alphabet and characters. I've been having conversations with my family in Italian while talking to colleagues and readers in English. I'm impressed with iOS 10's ability to detect languages on a word-by-word basis. I assumed the system could be confused easily, particularly with typos or words that are similar between two languages, but that only happened a couple of times over three months. Switching mid-sentence between Italian and English (as I often do when talking about work stuff with my girlfriend, for example) is fast and accurate. Multilingual typing is as important as copy & paste for millions of international users. Most new iOS features take some time to get used to; multilingual typing isn't one of them. After years spent fighting the keyboard switcher and auto-correct with multiple languages, multilingual typing is a huge relief. It's an elegant solution to a difficult problem, and it makes conversations flow naturally. I'm happy to see Apple catering to users who speak multiple languages with a feature that others will never (understandably) care about. Multilingual typing has already become an essential feature of my iOS experience. I love it. Apple's improvements to typing and QuickType don't stop at text and Proactive – they include emoji as well. In my tests, emoji suggestions have been good, often impressive. I've received emoji suggestions in both English and Italian, for a variety of common expressions (like "yum", "love you", or "I'm fine") and with up to three suggestions for a single word (such as "lol"). Popular emoji like the thumbs up/down, clapping hands, and high five can be suggested if you know the trigger word/expression. From this point of view, emoji suggestions are visual text replacements – for instance, I now type "great" and replace the word whenever I want to insert a thumbs up in a message. According to Apple, their Differential Privacy technology will be used to understand how iOS users type emoji. Hopefully, such system can learn and improve its emoji definitions over time as it looks at how people in aggregate use emoji in the real world. If it works, it's going to make one of the best tweaks to iOS even better. Despite the creativity shown by developers, third-party keyboards haven't received much love from Apple since their debut in iOS 8. Even without meaningful improvements to the API, two small adjustments in iOS 10 make using custom keyboards slightly better than iOS 9. The first change sounds like an Apple engineer remembered about a bug and found the time to fix it. In iOS 10, custom keyboards transition on screen with the same bottom-up slide of Apple's keyboard. Thanks to this, opening a custom keyboard isn't as jarring as before. Gboard (left) with a custom keyboard switcher; TextExpander updated for iOS 10 (right) with the new system one. I still don't think Apple is particularly invested in the idea of custom keyboards (the lack of any new features is telling), but at least they've done the bare minimum to ensure that a third-party keyboard can be used as a primary one without too much struggle. Apple must have recognized the value of some custom keyboards for accessibility purposes, languages iOS doesn't support, and sharing features for messaging apps that aren't iMessage. The likes of Google and Microsoft benefitting from these improvements is the kind of trade-off Apple will have to consider as they keep opening up iOS for everyone.